(1) Angelo was trying to give a speech in Queens and got called out for being bougie by a white guy (that was interesting). Cookie stepped in with her “around the way girl” speak and got the crowd to hate her boyfriend a little less. She even changed the venue for Mama Dubois’ big fundraising event. Angelo changed the name of “The Captain’s Ball” to “The People’s Ball” and it will now be held in Queens I think or somewhere not bougie. Mama Dubois called it “a street bazaar.” I swear fo God she looked like she wanted to punt Cookie into the Atlantic at least 5 times while she was doing her urban spiel. Moms parting comment to her son: “You’re getting a little too local, darling. Just a little too local.” I love Phylicia Rashad – that is all. (2) Jamal is rehearsing. D-Major is there. I can’t repeat this often enough – I do not like that guy. He called Jamal “babe” and had his arm around him when Lucious walked in. He yanked it away like Jamal had suddenly caught on fire. Down-low ahole. Lucious came through to hate of course. His conk needs a touch-up. Looking slovenly over there playa, giving pimps a bad name. Oh wait. Before he slunk off he delivered a threat – if Jamal airs out the family laundry he should then go kill himself. Lucious is a swell dad isn’t he? (3.1) But seriously about Lucious’ hair. Neither Puffy nor Jay Z would be caught dead looking this unkempt – you need to get you a fade bruh. Like yesterday. (4) Shine’s grimy a*s gave the video of Freda rapping to Tariq. Cause folks rap about what they know, Freda name dropped a few people that caught Tariq’s attention. He put together who Lucious paid to murk Frank. Ta-dah! Based upon these connected dots, Tariq gets a court order to freeze Empire’s assets for 30 days. The judge said this situation “smells” like it might be personal to Tariq. Tariq lied and said “naaaah” he just wants to catch a criminal. Liar. (5) Well I’ll be damned. Mama Dubois and Lucifer are having a private meet at a carnival. Wait, why are they at a carnival?? Whose idea was that? Are they at Coney Island? Why on earth would Diana Dubois go to a damn carnival? For any reason?? Sorry I digress. Well I’ll be damned again – these two strike a deal. 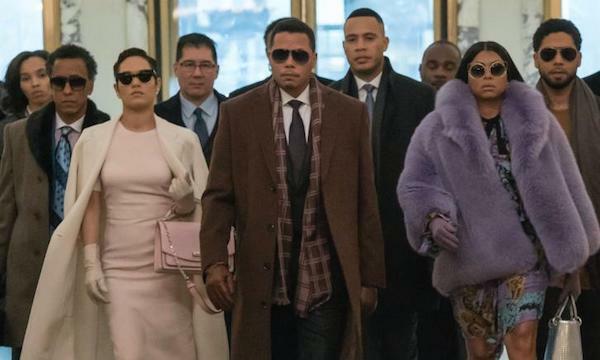 Mama Dubois wants Lucious to take care of a reporter who is gunning for Angelo and she agrees to tank Cookie and Angelo’s relationship. Treachery on a ferris wheel. Smdh. Q. She really didn’t have ANYONE else she could have gone to?? She’s supposed to be connected right?? Never mind. (6) Lucious and Anika “together” again is irking the ish outta me. Bleh. Anyway, they are about to get some morning action going when Mama Leah rolls in with a vacuum cleaner. Lucious: “Mama what are you doing??!? ?” Mama: “The same thing she’s doing but I’m sucking the dirt outta the rug.” OOOHHHH mama got JOKES! Anika, again I have to give it to her, heffa got a nice body and her lingerie game is stellar, tells Lucious he gotta make a choice – her and the baby or his mama. A question to my guy friends, let’s say you get that ultimatum and catch this view walking out the door. Whatchu gon do? (7) Jamal, rocking a hoodie that looks like it came from the set of the new Star Wars movie, is chatting with Cookie about performing again and being drug free. Cookie is like “bet, then you can give me all of your pills.” Jamal tried to play dumb for 5 seconds but then he went to go get them. Cookie picked up his murse and he gave her that stash too. She pressed some more and he went to retrieve yet another stash – those were in a cereal box. Jamal is a hype. Cookie threw the pills down the kitchen sink while giving him an angry but loving pep talk about performing clean and sober. Awwww a mother’s love. Sooooo no one else is concerned about the possible consequences of quitting cold turkey like that? Is it just me? Okay. (8) Turns out the reporter is that crooked cop dude who got deaded on Luke Cage. He and Lucious discuss Angelo. Oh fun, the reporter is racist. It’s fitting, I didn’t like his character on Luke Cage either. Hope he comes up on a non-ahole role soon. Okay, I’m back. Only Lucious gets Sticky Fingaz to perform a threat to a reporter. Safe to say that he gon’ cancel that hit piece on Angelo. (9) Rut roh. Lucious obviously did what he was supposed to do but Dame Dubois did not. Polls are showing that Cookie on the campaign trail is good for Angelo. People like her and she gives him street cred so it wouldn’t be a good idea to break them up just yet. Wish Cookie had campaigned with Hillary – sorry I had a moment. Of course Lucious doesn’t receive this information well. Diana is underestimating him. I don’t like this. It makes her look stupid. 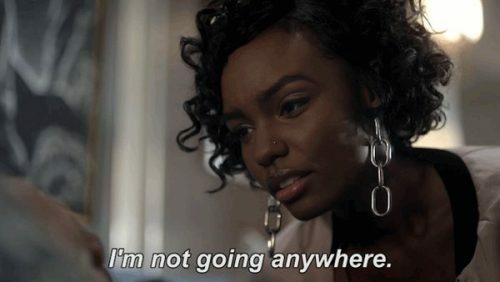 Also we all know there is no way in hell Lucious is just gonna let this slide – even though that’s exactly what he told her he would do. Poppycock. (10) Nessa finds Dre in a fetal position on the sofa in his office. He tells her about the bi-polar and how Rhonda took care of him when it hit, how she kept him under control, managed his meds, etc. Nessa’s response: “My name ain’t Rhonda and I ain’t doing none of that” (paraphrased). Andre was like “whaaaat?? you don’t like me no more?? It’s like that? WORD? ?” (more paraphrasing). But then Nessa was like I want you to man up and take care of this ish yourself cause I wanna be here for the long haul boo and I need you to get it together.” (yes more paraphrasing). Awwww hell, Dre looks over and sees ghost wife Rhonda sitting in a chair. This ain’t gon’ work. 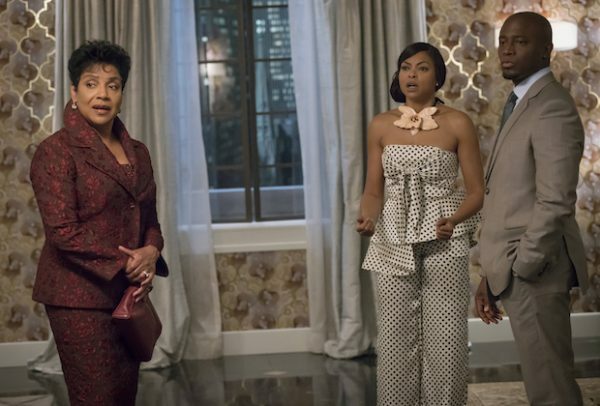 (11) Lucious is back at Cookie’s place, quoting Al Capone and getting on her nerves. She is rightly pissed off cause she can’t use any credit cards. Lucious tells her about the assets being frozen and then reassures her that everything will be fine. She gives him a look which flashes us back to teenage Cookie and Lucious. He’s remembering how bold she was. She initiated their first kiss. Teenage Cookie is so d*mn cute with her fast a*s.
Before he leaves he notices Cookie has a bag full of cash. I’m going to do that one day because why not? BALLIN! 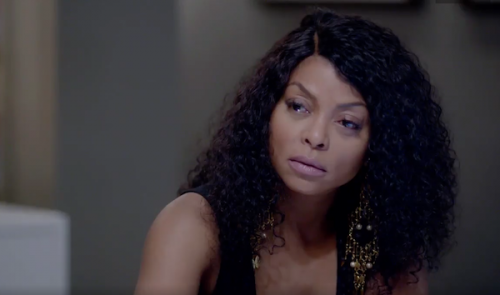 Anyway, Lucious tells Cookie Angelo is just another suspect politician with skeletons. Cookie ain’t trying to hear it. #ByeLucious! (12) Lucious and Thirsty stop by Tariq’s job to let everyone know he and the copper are related. Lucious gives Tariq their father’s police shield and then made a speech about brotherhood, something something, family, etc. Btw, it’s almost comforting to see Thirsty is still rocking terrible suits. We are in uncertain times, I welcome a little familiarity. Don’t change Thirsty!! 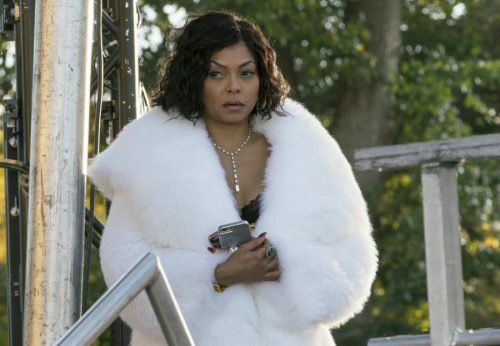 (13) Hmmmm so Cookie is rocking a huge white fur over what I think is a gold and black onesie with silver ankle boots. Okay. Oh yeah Jamal is MIA. Sure enough, he is at home sick af because this is what withdrawal looks like. Smdh. Jamal is begging Cookie for a fix. Cookie initially tries to talk some sense into him but then she folds and uses the skills her plumber father taught her to retrieve some pills from the drain. Two things: (1) Gross and (2) So this is how we see Cookie employ lessons from her pops? Okay. Oh it’s not a onesie, it’s a dress and it’s black, gold and silver. That’s better. She enables her junkie son so he can perform cause Lucious can’t win. Or something like that. I’m tired of these antics. I AM looking forward to seeing Hidden Figures tho! Bring it!! 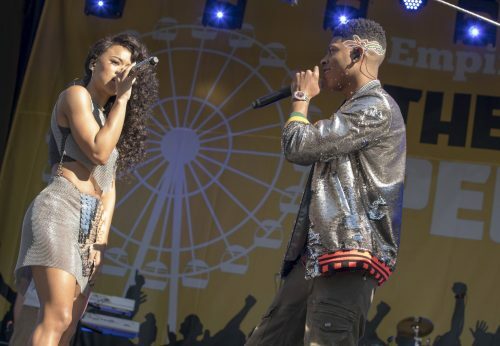 (14) Tiana and Hakeem perform and the crowd is loving it. For some reason we got a close up of a guy smashing a pyrex dish of spaghetti? Sway?? (15) Argh!! For the love of shade! Shine shows up at Empire talking about his new deal with the company ain’t working because he can’t access any accounts. For some reason, Thirsty (obviously w/ Lucious’ permission) speaks up about the 30 day freeze. Why tell that fool that info??? 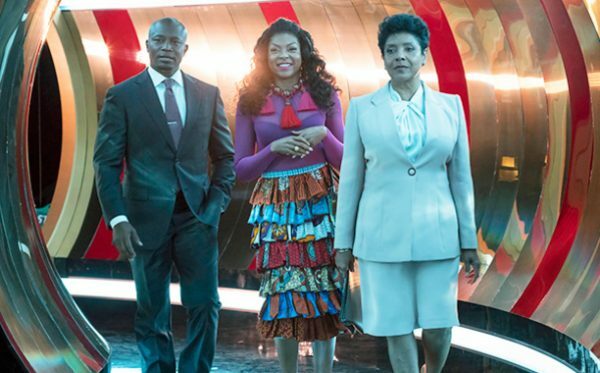 Shine acts like he’s a real friend and offers to float Lucious the funds – in return he wants a stake in Empire. Of course he does. Also, this is stupid. Why would Lucious even entertain this nonsense? He JUST talked all this ish to Mama Dubois about being a big damn deal and now he contemplates getting more entangled with this two bit no talent hustler dude who was JUST gunning for him and his whole family a few episodes ago??? Had y’all riding around in armored tanks through NYC ‘member???? (16) Hakeem tries to kiss Tiana and at first she’s like “boy bye” but then he mentions his daughter and she melts. We are so damn easy. “Takeem” is back y’all! (17) So happy this is the fall finale cause I need a long break. Andre is at the beach with his ghost wife finally saying goodbye for real. She gives him one last pep talk and makes him promise to get that murdering heffa Anika. So much happens on this d*mn show. Almost forgot she killed their baby and technically killed Rhonda as well. Sh*t, is Anika gonna make it to season 4?? Anyway, ghost Rhonda walks off into the water. Bye girl. (18) Jamal makes it to the stage. But before he goes on, he gets a “love tap” from moms. Cookie kills me trying to slap people into sobriety. He slays. Channeled a little Micheal Jackson. Whew! I did get nervous when he ripped off his jacket tho. I was like please please please don’t rip off anything else. (19) Meanwhile back at Leviticus, Tariq and Shine have a quick chat. Tariq mad cause Shine played him. Whatever. Key info from this scene. Shine’s real name is “Leslie.” Ouch. (20) Well Jamal’s family had a surprise waiting for his addict a*s when he got off stage. That’s right, a direct trip to rehab. No one ever responds well to that news. Poor thing. (21) Tole y’all Lucious wasn’t going to just let Mama Dubois get away with welshing on their deal. Reporter dude and a cameraman literally pop up from behind Lucious asking questions about Angelo’s DUI. Apparently there was a little more to the story than most folks know about. Sounds like he pulled a Kennedy (too soon?). It was a little odd that everyone turned to watch Lucious walk away. Why they do that? Y’all know he trifling af. (22) Shine is still at Leviticus. Now he’s having a stripper party. Fun. Dre’s crazy a*s is hyped, walking down that aneurysm inducing multi-colored mirrored hallway repeating to himself that “he’s the most ruthless.” Sigh. Dre congrats Shine on his power move. Shine is suspicious. Dre tells him I know what you did playa, I got receipts. Sidebar: Am I the only one who thought Dre sounded like Denzel for a second?? Did anyone else hear that??? Moving on, they chat some more and oddly enough Dre strikes a deal with him. Again, why on earth would any Lyon think they can trust Shine??? SIGH! 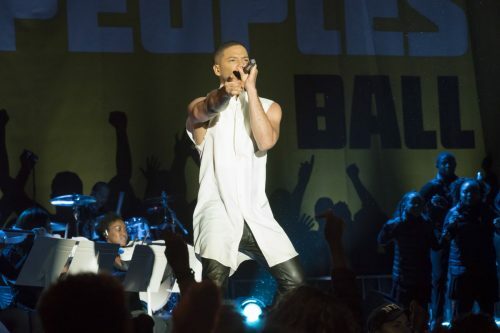 The big cliffhanger – Dre is planning to kill Lucious. Raise your hand if you believe that BS. Right. Me neither. Now Shine not making it to season 4 I can see but Lucious dying – yeah okay. Loved this review! Truthfully, getting a bit tired of Empire overall. The storylines are not working for me. The main characters have changed so much (and not in a good way) that I don’t e’em know these people. I need Timbaland back on music. Jamal’s whining is getting on that last good nerve. I love Phyllicia Rashaad, but I want more mega-stars on the program, like Naomi Campbell, and Alicia Keys. Gina Gershon was a cute flashback, but how many young viewers even know her? That being said, this episode was not as tiring as the last two or three. The Kennedy caper was too contrived for me. Pizzagate would have been so on point as an alternative RELEVANT scandal. Or something like the Clinton/Ron Brown thing; or the Haiti thing. Something more contemporary would have been nice. Also, I can see that all the set-ups will be deceptions and all roads lead to Lucious, so I may not even bother watching next season. Although wouldn’t it be funny is evil Dre ends up sleeping with Anika? Then sober Jamal can get a turn and she’ll be the family affair! LOL. Still, they are getting a little too predictable. I’ll read your re-caps though, cuz I need the laughs. Denise!! Heeeeeey! Girl I completely checked out for a good week and a half. I needed that break. I hear you re getting tired of it. This really might be my last season recapping this show or at the very least I need to make the recaps shorter. Losing entire nights messing with these folks. Soooo right re Jamal’s whining and the need for incorporating more contemporary headlines. Sigh.